Seldom do you hear voters, journalists, or, frankly, anyone commend Mitt Romney for his authenticity. Even among his fans, words of praise for the man are typically limited to "adequate," "haircut," "electability," and "there’s nobody else." But what Romney lacks in normal human emotion, he more than makes up for with effort. 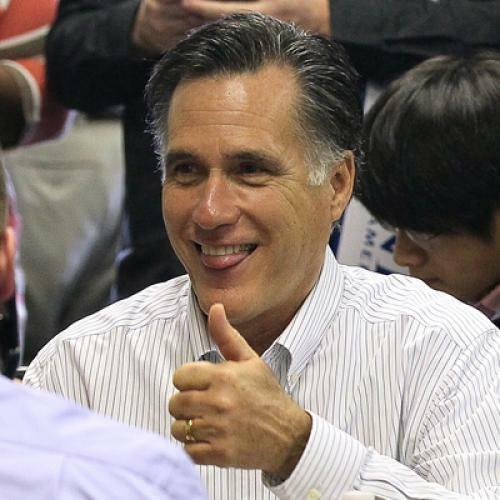 Here, we’ve found some instances of Romney doing his very best impression of a human being. Here, locked in the embrace of an eager supporter, Romney gives a broad smile while trying his best to wriggle free. Mitt’s most common strategy when feigning adoration for a supporter: The wider the eyes, the better. Nothing says I'm human like wide, unblinking eyes. Stumped on allegations of flip-flopping? Shocked by the audacity of Gingrich? No matter the stressful situation, this calm and coy half-smile is the perfect mask to wear. It is the ultimate luke-warm expression that reveals nothing (except maybe a few laugh lines). This bemused expression is actually concealing Mitt's debilitating cognitive dissonance. On the one hand, eating fast-food sandwiches is a good, regular-guy thing to do. On the other hand, Subways, like other forms of mass transportation, are a symbol of decadent, European lifestyles. What to do? "Oh boy, these hot rods are neat-o! What's the speed limit in this county?" Romney's grin is particularly forced here because he just learned that flying commercial means you have to share the cabin with other people. Clinton felt your pain, and here Romney…almost does. With his lips pursed, Romney looks as if he’s about to empathize. But, alas, with all the other hands to shake, going all the way just wouldn't be efficient.